Vijay Devarakonda's Mass Reply To His Haters! Vijay Deverakonda's Tamil and Telugu bilingual political venture NOTA directed by Anand Shankar hit the screens on October 5th and is having a decent run at the theaters. The venture is made under the Studio Green banner with music by Sam CS and has Mehreen Pirzada as the female lead alongside Nassar and Sathyaraj in vital supporting roles. 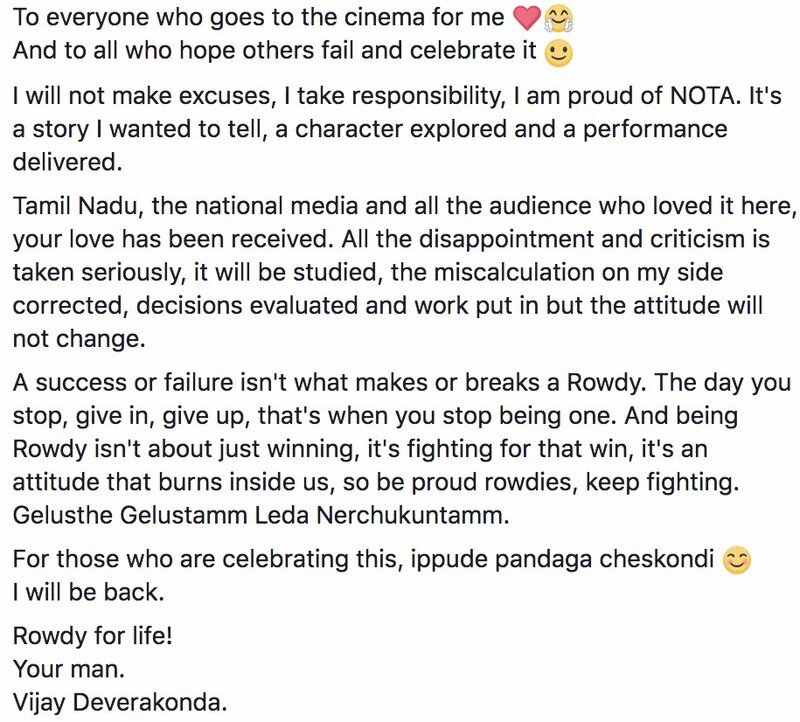 Vijay Devarakonda's NOTA also received some average comments and the star has now released a press note regarding the negative comments. >>After NGK It's a Vijay Devarkonda Film ! >>NOTA - Yethikka Yethikka Full Video Song Is Out! >>NOTA: Raja Raja Kula Full Video Song Is Out! >>NOTA - Hey Amaicha Video Song Promo Is Out! >>Wow: Vijay Deverakonda To Romance Kalakalappu 2 Actress ! >>Vijay Deverakonda's Heroine Next Project ! >>Massive: Arjun Reddy Hindi Remake Update ! >>Kanaa - New Making Video Is Here! >>Kanaa - Sneak Peek Is Here! >> BREAKING: Vijay Devarakonda Next with Kakka Muttai Talent?